CES 2018: Ring reportedly settles with ADT in Zonoff lawsuit for $25 million, plans to launch super-cheap 'Ring Alarm' security system soon, adds Z-Wave sensors, acquires Mr. Beams (Wireless Environment, LLC). 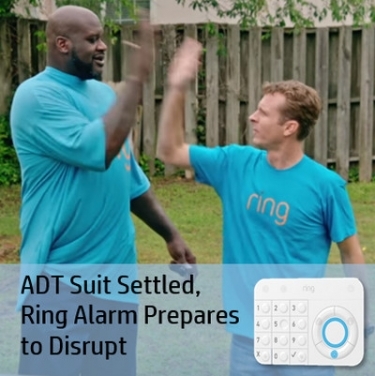 Real-life sheriff and Ring pitchman Shaquille O'Neal high-fives Ring CEO Jamie Siminoff as the company is freed to sell security system after settling Zonoff lawsuit with ADT. There's much to report on Ring after CES 2018. The famous maker of video doorbells apparently has settled with ADT in the “Zonoff” lawsuit and will launch its newly branded Ring Alarm system soon. Also, Ring enhanced its surveillance app, and acquired the wireless lighting company Wireless Environment, LLC, dba Mr. Beams. Details on the acquisition below, and forthcoming. It was just a few months ago that Ring announced the new Ring Protect security and home automation system based on Zonoff's Z1. Ring CEO Jamie Siminoff has maintained all along that his company rightfully owns the technology through a $1.2 million contract it had with Zonoff before Zonoff shut down. Now that the lawsuit is reportedly settled, Ring will start shipping the newly branded “Ring Alarm” this spring. We imagine the company dropped the "Protect" moniker because Nest already uses the brand for its smoke/CO detectors. That’s obscenely cheap. The closest equivalent is the ADT/Samsung SmartThings security and alarm system that retails for $450 and starts at $24.99/month for security monitoring and interactive services (no contract required). Granted, the Samsung product has a nice touchscreen, a much broader feature set, and a proven system with Nortek's 2Gig as the hardware provider. Here’s the big and very complilcated question: Ring may have settled with ADT, but what about Alarm.com (Nasdaq: ALRM)? Will the very popular SHaaS provider move forward with a lawsuit against Ring? Last year, Alarm.com inherited some patents from erstwhile competitor Icontrol, which it acquired last year (Comcast bought part of Icontrol, as well). At the time, Icontrol was in the process of suing Zonoff for patent infringement. With Ring’s very threatening business model, it seems Alarm.com would absolutely continue the lawsuit it inherited … if the company believes there’s infringement (in general, merging professional security monitoring with interactive home automation via the cloud). It’s possible Alarm.com quietly “settled” with Ring when ADT settled with the doorbell giant, earning some kind of licensing agreement in exchange for kiboshing a patent suit. ADT is Alarm.com’s customer for at least five years, thanks to a deal negotiated during the Icontrol acquisition. ADT had been Icontrol’s flagship customer since basically day one. That could be one reason that Alarm.com isn’t suing ADT and Samsung SmartThings for their latest offering – a DIY security and home automation system powered by Nortek’s 2Gig. Alarm.com still has lawsuits pending against competitors SecureNet and ipDatatel. It would be really surprising if Alarm.com were to allow Ring to go forward unimpeded. Ring will be a real threat to Alarm.com’s business model, even though Ring targets DIYs and Alarm.com goes to market through professional installers. In addition to the Alarm-specific news, Ring introduced some other goodies at CES, including a relationship with pitchman Shaquille O’Neal (“Defend Your Home Court Like Shaq! ), a real-life sheriff who made an appearance at the show. Also at CES, Ring introduced a “revamped” Stick Up Cam, the company’s “first-ever” indoor/outdoor camera. More interestingly, Ring is improving its app and back-end services. Users will be able to group cameras by location and view multiple cameras from a single screen. Also, new “preview tiles” will give users a “sneak peek” of every camera in an ecosystem, and a new event timeline will provide a “scrubbed” view of video to present the most important events of the day. Finally, Ring acquired a lighting company called Wireless Environment, LLC, dba Mr. Beams. Stay tuned for more details on that company and its patent portfolio.